SpyderBoyz.com, the definitive source for Can-Am Accessories! 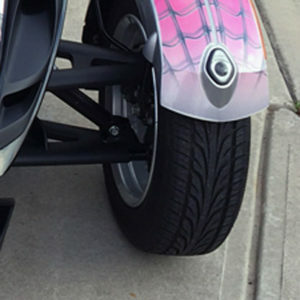 Take a bite out of the road with our Flying Tigers Shark Face Spider Teeth Accent Kit. You choose the look you want for your machine. This peel and stick accent kit comes with Left & Right Side Shark Face and a pair of eyes to complete the look. Your Flying Tiger Shark Face Teeth Kit comes with application instructions, squeegee tool, promoter and free sticker pack. Nothing else is needed to install this kit. Teeth sized at 6″x20″ and have a glossy finish. Please confirm application surface before ordering. Would you like to make it reflective? My love for the Spyder motorcycle was discovered in 2008 when I first set my eyes on one. I purchased my own in 2009 and fell in love with this machine. By owning a Spyder I learned how to customize and work on this machine. I have entered and won several motorcycle contests and won due to my creativity and graphics. The attention that I received from riding my bike inspired me to help and show others how to customize their machines.